Cornwall’s culinary gift to the world will be celebrated across the country with the first-ever Cornish Pasty Week starting on Sunday (February 25). Hundreds of bakeries, cafes, shops and factories with help spread ‘oggy mania’ throughout the UK. 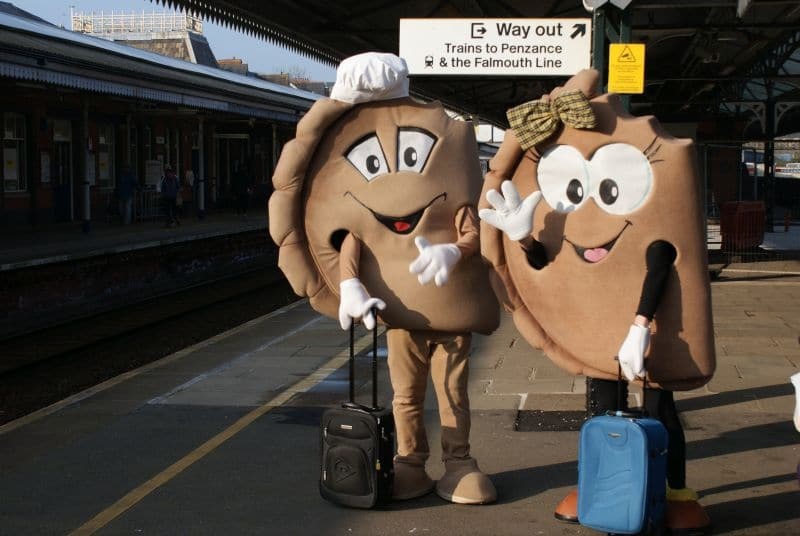 The big week begins on Sunday when a delegation including a giant Mr and Mrs Pasty take the GWR Night Riviera Sleeper service to London Paddington to bring the far-west’s favourite food to the capital. In the afternoon of Monday February 26, the Cornish Pasty Association, the trade association behind this initiative, and George Eustice MP for Camborne and Redruth and Minister of State for Agriculture Fisheries and Food, will host a reception at the Houses of Parliament. This is a moment where pasty producers and members of the Association will have the chance to discuss the economic importance of the Cornish pasty industry at the very heart of government. Throughout Cornish Pasty Week, pasty producers, bakers, shops, staff and customers will all be joining in. From promotions and competitions to the #pastysmile – the ubiquitous posting of pasty selfies on social media, the UK will be hard pushed to avoid seeing, eating, smelling or hearing about the iconic Cornish pasty. On Monday 26th Feb, the West Cornwall Pasty Company will be selling pasties at just £1.99 each throughout all their shops. On Tuesday, Wednesday and Thursday, look out for free Cornish pasties being given away by Proper Cornish on select GWR trains from Bodmin Parkway. Warren’s Bakery will be promoting their ‘pasty passport’ and a school’s competition to design a new pasty flavour. Let them Eat will be delivering hot fresh pasties to the homeless, across the Tamar valley throughout the week, making donations to local food banks. Prima Bakeries will be running a Facebook competition to win a box of pasties to be delivered to your door. And there will be more! Be sure you follow all the highlights of the week on Facebook @cornishpastyassociation or Twitter @Cornishpasties1 for the latest updates, news, promotions, events and activities. Cornish Pasty Week has grown out of the World Pasty Championships held at the Eden Project every year on the nearest Saturday before St Piran’s Day. The grand finale of the week will be the seventh annual championships at Eden on Saturday March 3 when pasty-makers will descend from around Cornwall, the UK and the world on the home of the famous Biomes near St Austell. The day of celebration culminates in the Oggy Oscar awards for the best junior, amateur, professional and company pasty-makers and a special Pasty Ambassador Award. To find out more go to www.edenproject.com.